Koyasan is one of the most famous tourist place in Kansai region. While today getting there is pretty easy as most people just take the Nankai Line, and then the cable car to the temple complex, for many centuries, people had to walk to the top of the mountain! 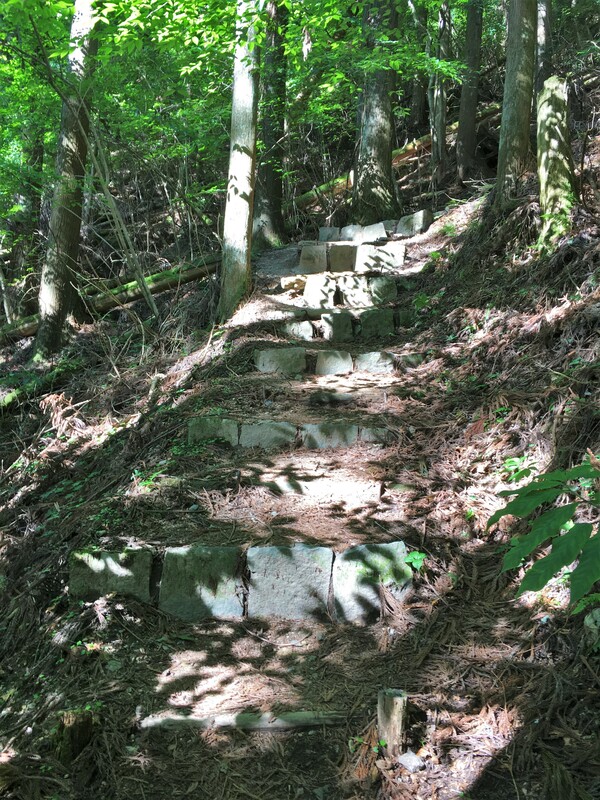 The most famous of these old trails to Koyasan is the main route, the Choishi Michi [町石道]. Created by none other than the founder of Koyasan, Kukai, this trail is still popular for many people visiting Koyasan every year. 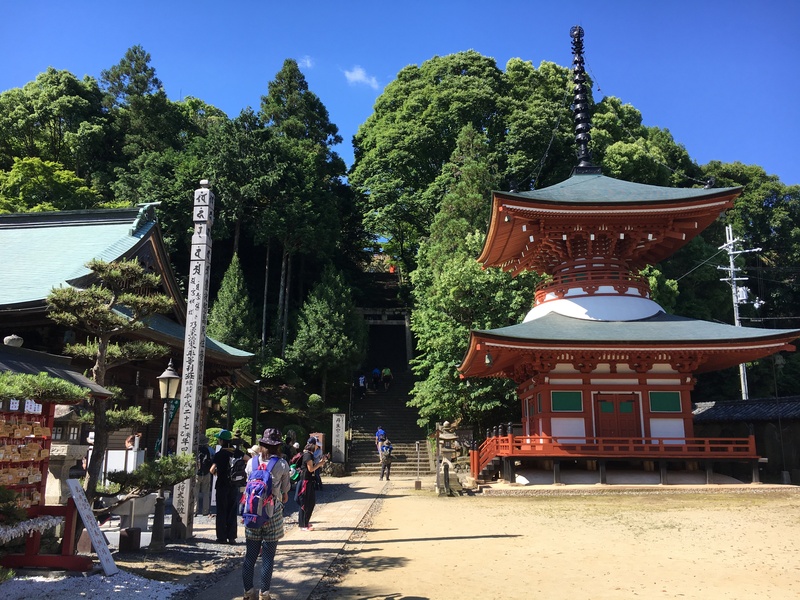 The Choishi Michi starts from Jison-in Temple in the small town of Kudoyama, and leads all the way to the Daimon Gate at the top of Koyasan (20km), and then to the Okuno-in ( and additional 4km). If you walk entire trail, it would take 7 to 8 hours. 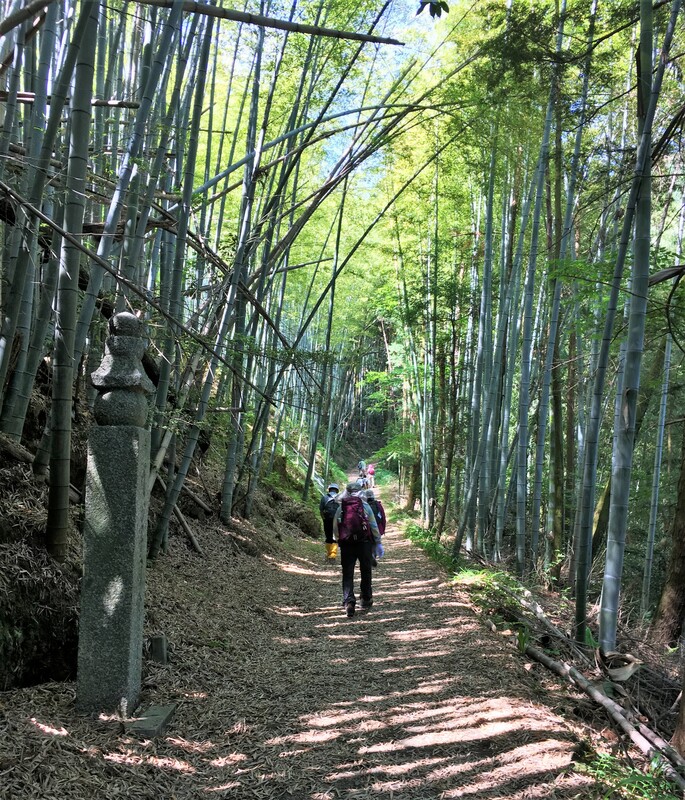 When this trail in turn also got registered as a World Heritage site in 2005 when this trail was registered as World Heritage, the trail became very popular for people to hike to Koyasan. 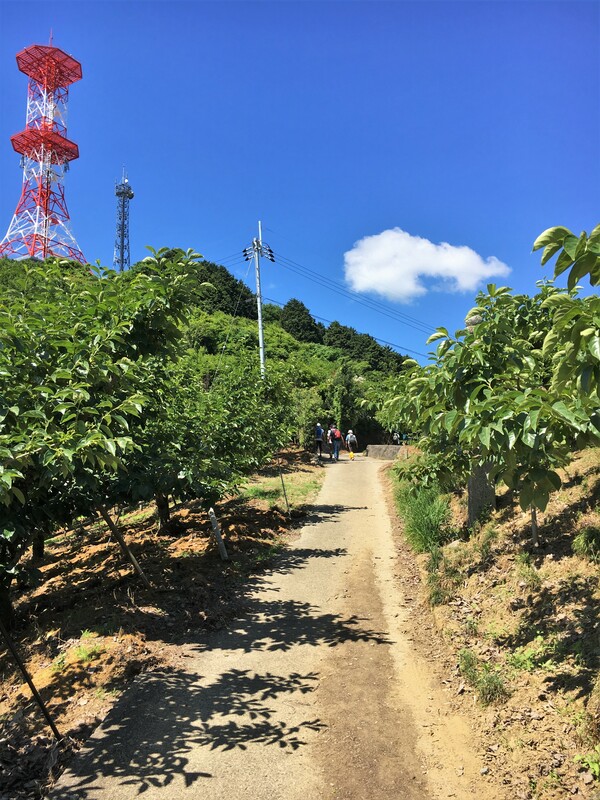 Around the end of May, Kudoyama hosts their annual hiking event, which we participated in this year’s (2017) hike. This year, the hike celebrates its 33th year. The entry fee is 1,000 yen and if you start to wear out, the town provides transportation to the temple at the half way point. If you think you’d like to try hiking this trail, but are scared to go it alone, consider participating in this hiking event. Bears have been spotted along the Choishi Michi, so do not go walk the trail alone, especially not around dusk or the early morning. There are no cliffs or steep terrain, so you probably don’t need any heavy gear. At the start of the trail is fairly hilly and has no shade. However, after an hour or so, the trail will flatten out as it enters the woods. There is often a lot of snow on the trail in the winter. The Choishi Michi starts from Jison-in Temple and the closest station to Jison-in is Kudoyama Station off the Nankai Koya line. To get to Kudoyama Station, take Nakai Koya line to Hashimoto Station, then change to a train bound for Gokurakubashi. 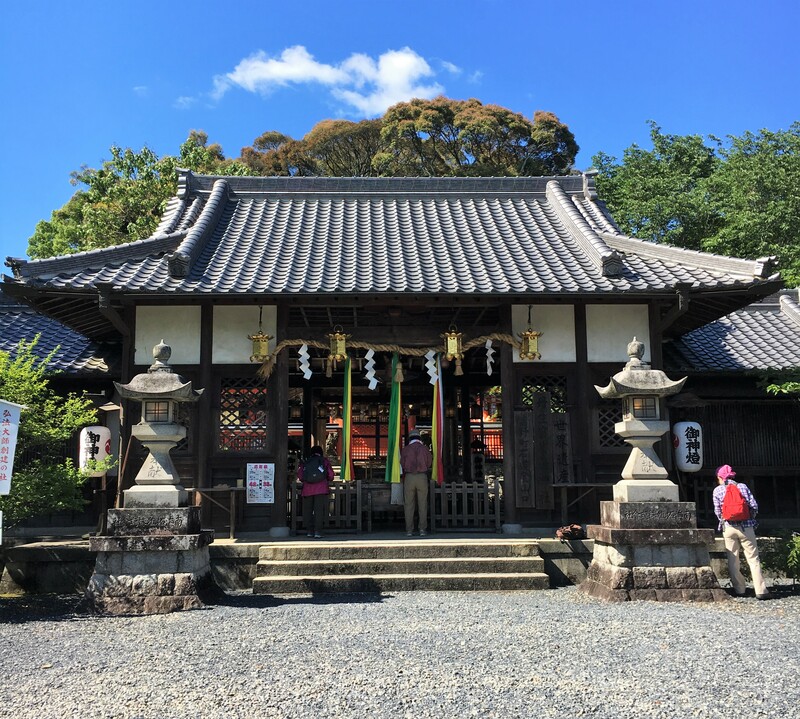 Once you get out of Kudoyama Station, head to Jison-in Temple. 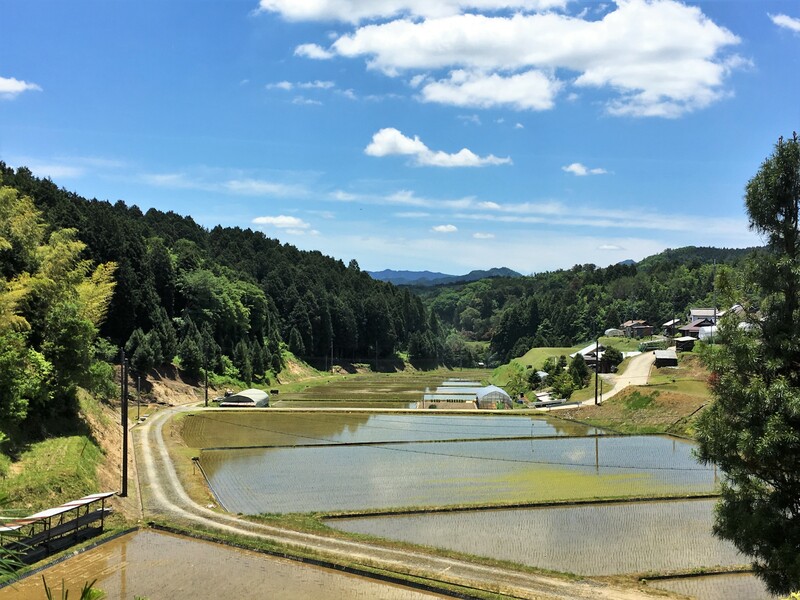 However, Jison-in Temple may hard to find, so make sure to have map of Kudoyama and Choishi Michi trail with you in advance. From Kudoyama Station to Jison-in is around 20 minutes on foot. Jison-in Temple:climb up the stairs next to pagoda. Actually the very first of 180 choishi markers is right next to the stairs. 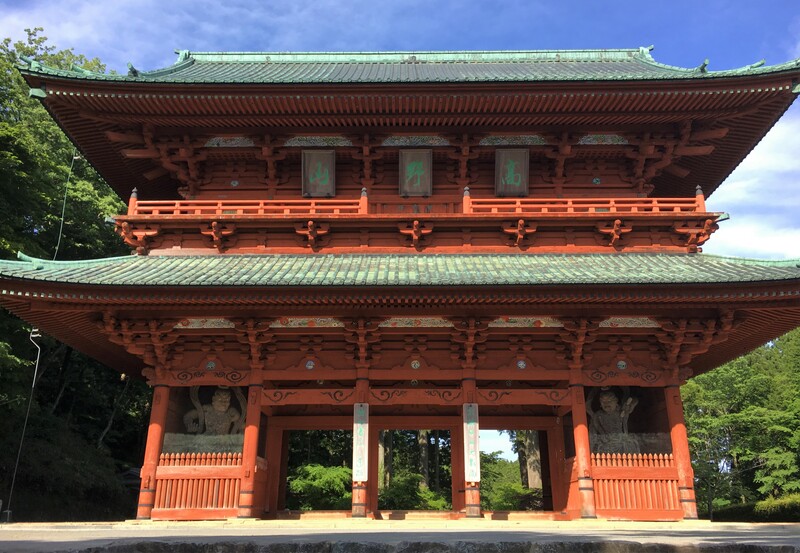 Once you climb up, you will see Niu Kanshofu Shrine, where the Shinto gods of Koyasan, god and Koya god are enshrined. Many people, pray for their blessings here before walking the trail. 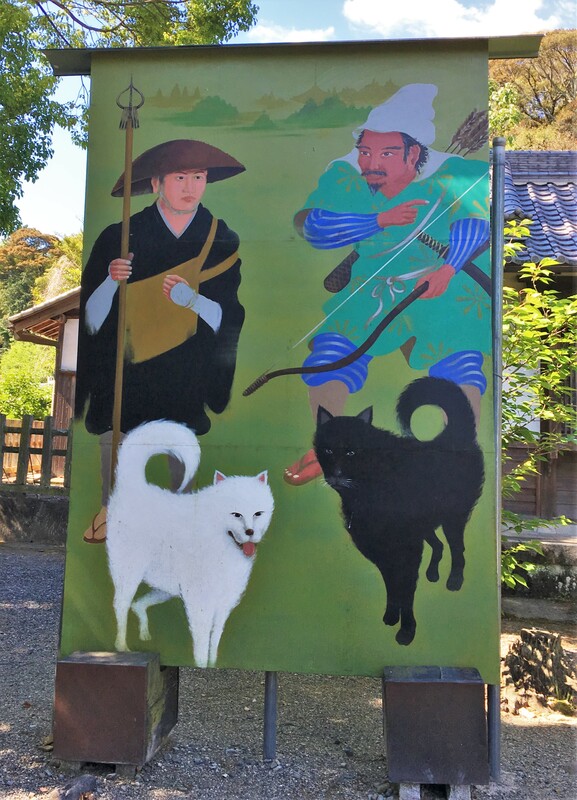 The god Koya: Koya god, appeared like a hunter with two dogs that in turn, guided Kukai to Koyasan. After this, go down the small road from the back of the shrine and turn left. Then, go up the hill! 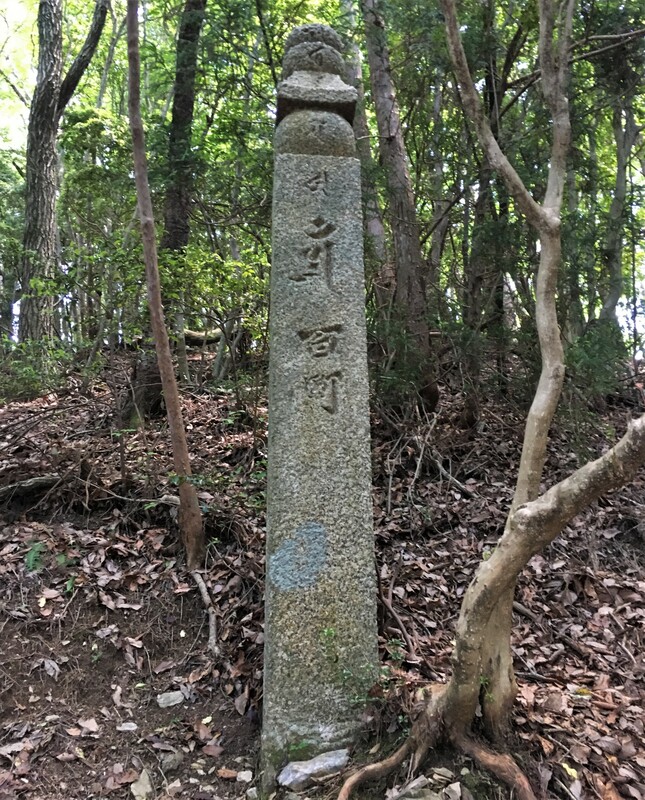 First choishi marker: We started trail 8:50. After this hill, the trail is pretty straightforward. Still, you probably should get a map in advance so that you can see the whole picture of the trail. After this small bamboo forest, you will walk through an orange and persimmon grove. 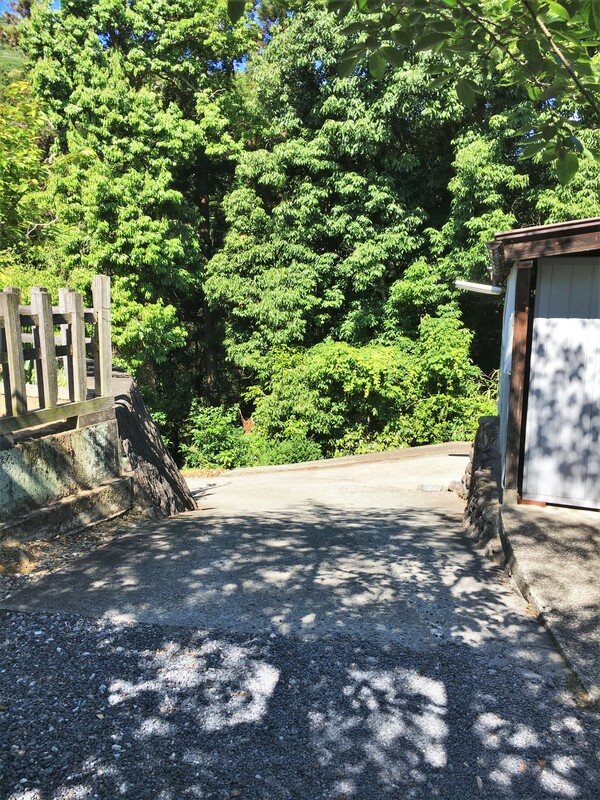 Since this area is pretty hilly with no shade, it’s sort of a rough start, but don’t worry, after an hour you will enter the woods and the path will even out. 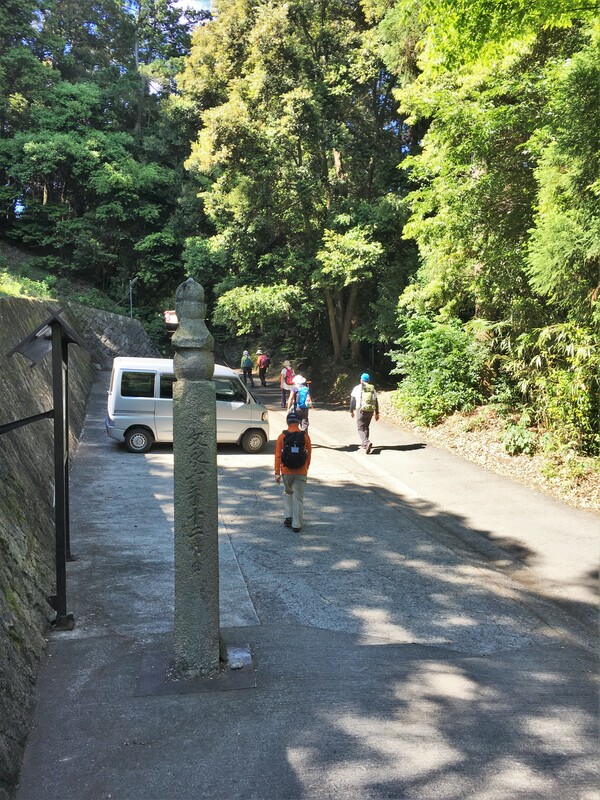 All along the trail every 108m, are stone markers called Choishi. 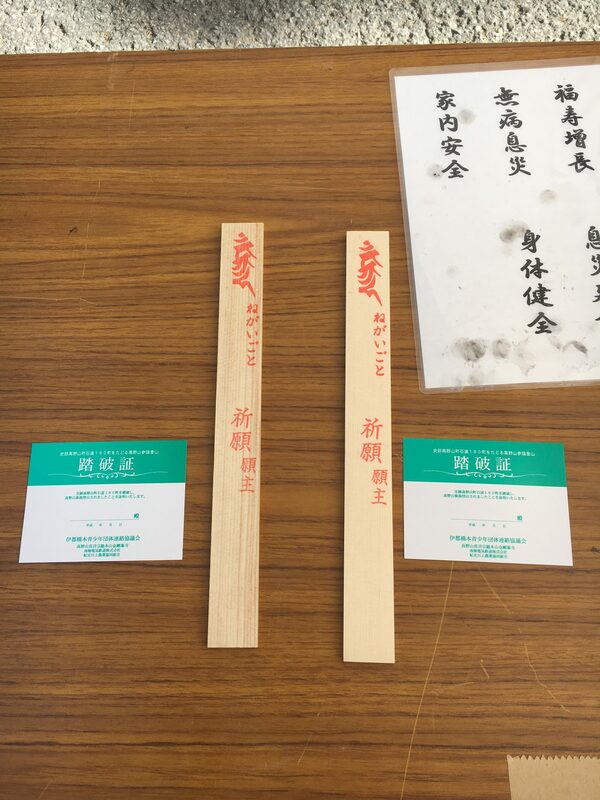 Originally, Kukai made these markers out of wood, but in the Kamakura Period, all the markers were replaced with stone ones. Many of the choishi standing today are the very ones made in Kamakura Period. If you pay attention to Choishi, you will notice different characters on them. These are Sanskrit letters which corresponds to “Air” “Wind” “Fire” “Water” and ”Earth”. 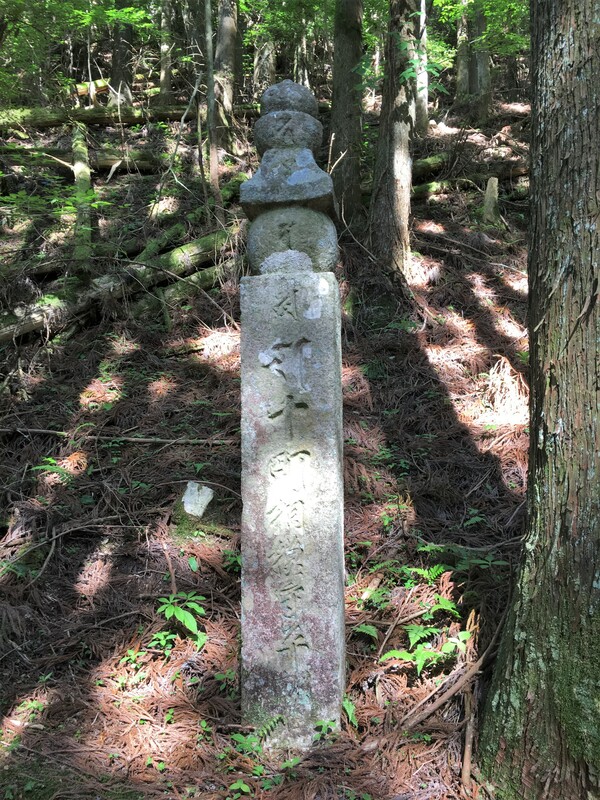 There are 180 stone markers from Jison-in to Daimon, and 36 from Daimon to the Okuno-in. Since Those trails are really easy to find, all you need is to follow this and it is unlikely to lose way in the woods. As you walk trail you will see two torii standing next to each other. 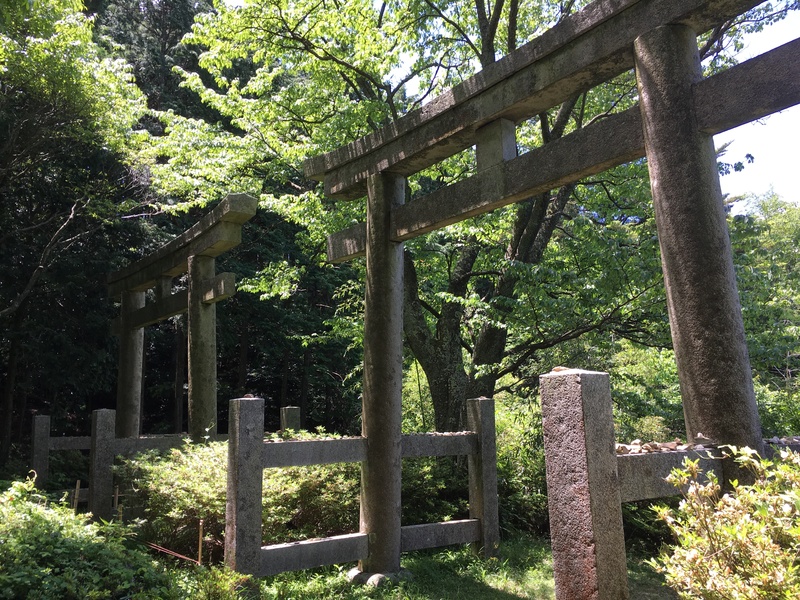 These torii were originally built out of wood by Kukai, but converted into stone in Edo Period. The torii represent the gods Niu and Koya. At the point it was 11:12 and we were at the 120th choishi. After a while, you will see a pretty open rice paddy. Many people took this opportunity to have their lunch as it was almost 12 o’clock. 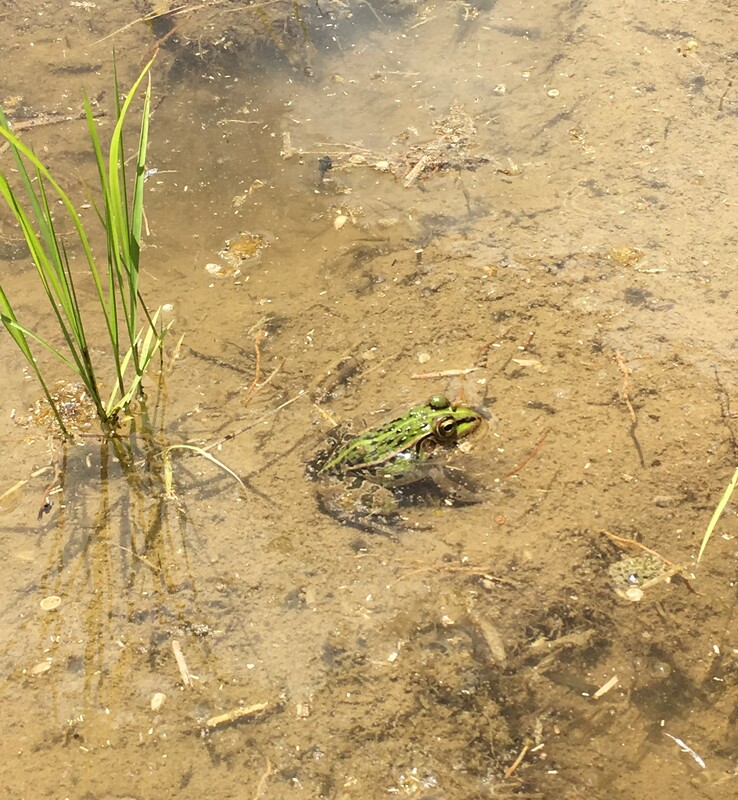 Adult frog: This frog, called tonosama gaeru, was once common, but very rare these days. 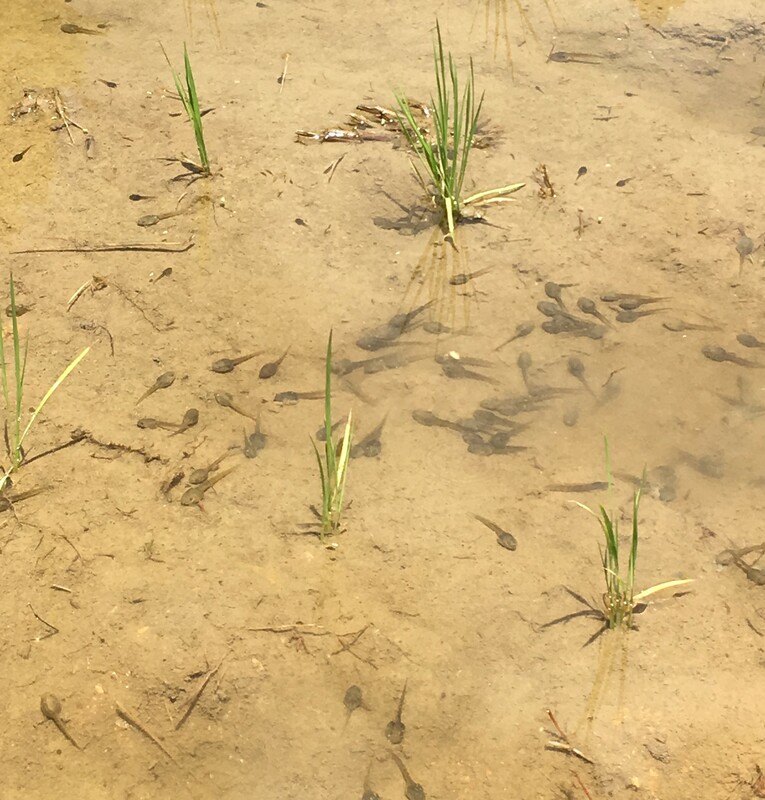 Tonosama gearu tadpole :even the tadpoles are huge! After this area, you will finally see 100th choishi. We felt like we’s really made progress, but it wasn’t even half way. Yatate: the trail continues on the left side of the store. Finally, around 13:40 we reached our halfway point. Yatate has a little souvenirs and serves light food too, including Koyasan’s famous food Yakimochi. There are vending machines and bathrooms here too. 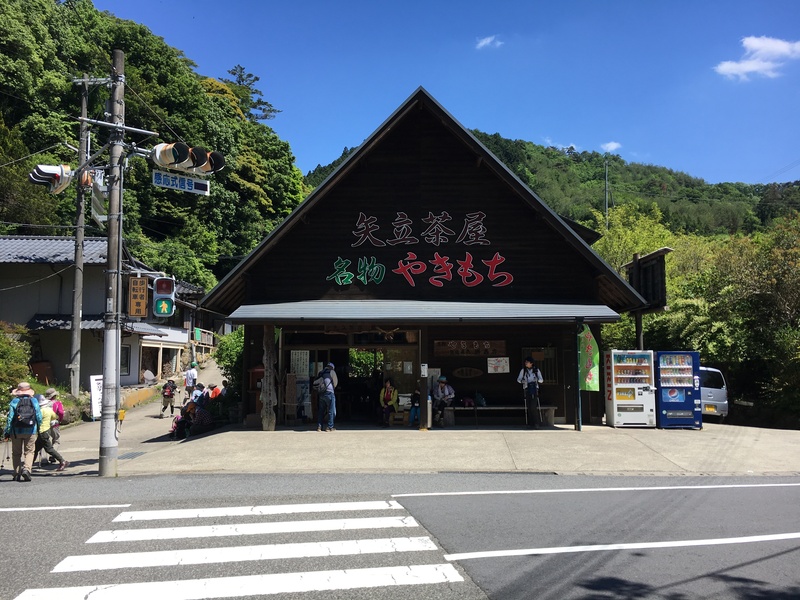 If you choose to participate in the annual hiking event, here you can get bus service to Koyasan. But keep on pushing! It is only about 6km to the end of the trail! 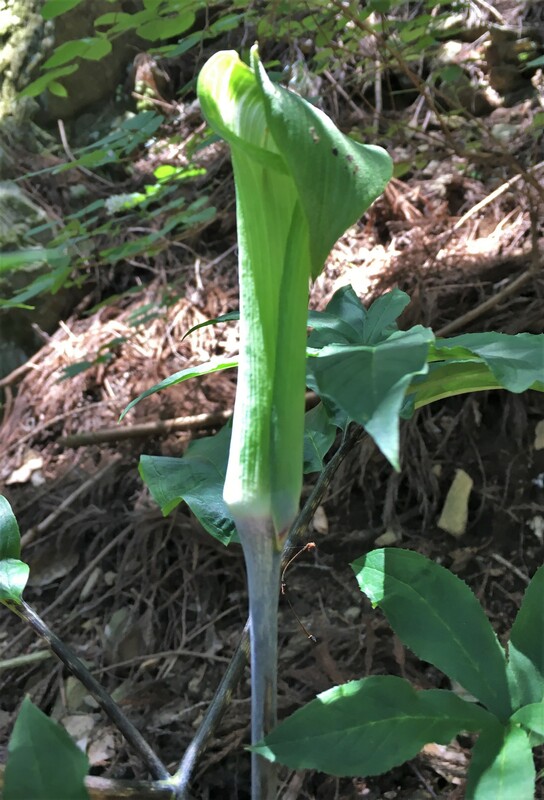 Along Choishimichi trail, you can find many interesting vegetation that you have probably never seen. Ginryo-so: Literally means “silver dragon plant” a.k.a. 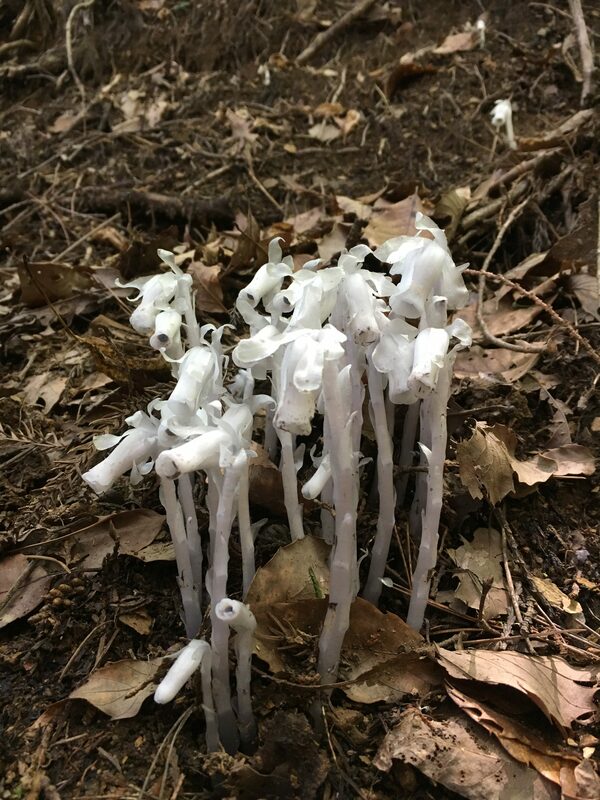 ghost mushroom. It looks like a mushroom, but it is parasitic plant. Urashima-so: Urashima-so is very interesting in that it can change gender while its growing. It is a very rare plant indeed; very hard to find! Finally we reached the homestretch! After the last flight of long stairs, is the Daimon Gate! This huge 25m gate is the main entrance of Koyasan. Danjo Garan, and Kongobuji is not far away from this gate. When we completed the hike, we got some coupons and a goma. A goma is a charm that you write your wishes on and is later burnt in the special ceremony. This particular goma is exclusive to Shingon Buddhism.